I have a new story out! It’s in the anthology Defying Doomsday from Twelfth Planet Press, which is edited by Tsana Dolichva and Holly Kench. As you can probably guess, it’s a collection of apocalyptic/post-apocalyptic short fiction, but with a twist: in each story, the protagonist is disabled. If you’ve ever paid much attention to this sub-genre, you’ll recall that disabled characters, when they exist, exist pretty much solely to die early on. An illustration of edge and cruelty, and all so very realistic (and that’s a loaded descriptor in genre fiction, one that’s continually applied only to some circumstances and not to others). But if you’re used to navigating a hostile world, to constantly being at a disadvantage, who’s to say you can’t use these skills to good effect when disaster hits? The worst part of the apocalypse was the sheer bloody boredom of it. Anna had never expected to be the – apparently – sole survivor of a quick and dirty plague, but if she had, her expectations would have been different. All the apocalypse stories she knew had conflict and danger and high stakes, arenas and journeys and great symphonic soundtracks. 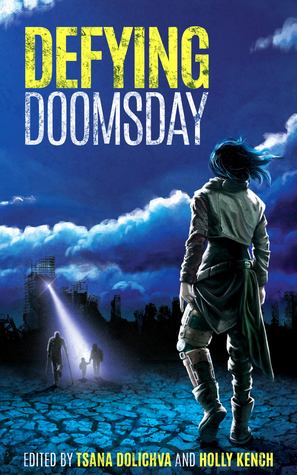 You can pick up a copy of Defying Doomsday at Amazon, or any other number of places.